Researchers have made the first direct visual observation and measurement of ultra-fast vortex dynamics in superconductors. Their technique, detailed in the journal Nature Communications, could contribute to the development of novel practical applications by optimizing superconductor properties for use in electronics. Superconductivity is a state of matter in which an electric current can flow with absolutely no resistance. This occurs when certain materials are cooled below a critical temperature. The effect is useful for various applications, from magnetically levitating trains to MRI machines and particle accelerators. It also sparks the imagination with thoughts of lossless power transfer and much faster computation. However, superconductivity is, generally speaking, suppressed in the presence of magnetic fields, limiting the ability to use these materials in real life applications. A certain family of superconductors, called type 2, can withstand much higher values of magnetic fields. This is thanks to their ability to allow the magnetic field to thread through the material in a quantized manner, in a local tubular-shaped form called a vortex. Unfortunately, in the presence of electric currents these vortices experience a force and may begin to move. Motion of vortices allows for electrical resistance, which, again, poses an obstacle for applications. Understanding when and how vortices will move or remain localized is the focus of much scientific research. Until now, addressing the physics of fast moving vortices experimentally has proven extremely challenging, mainly because of the lack of adequate tools. 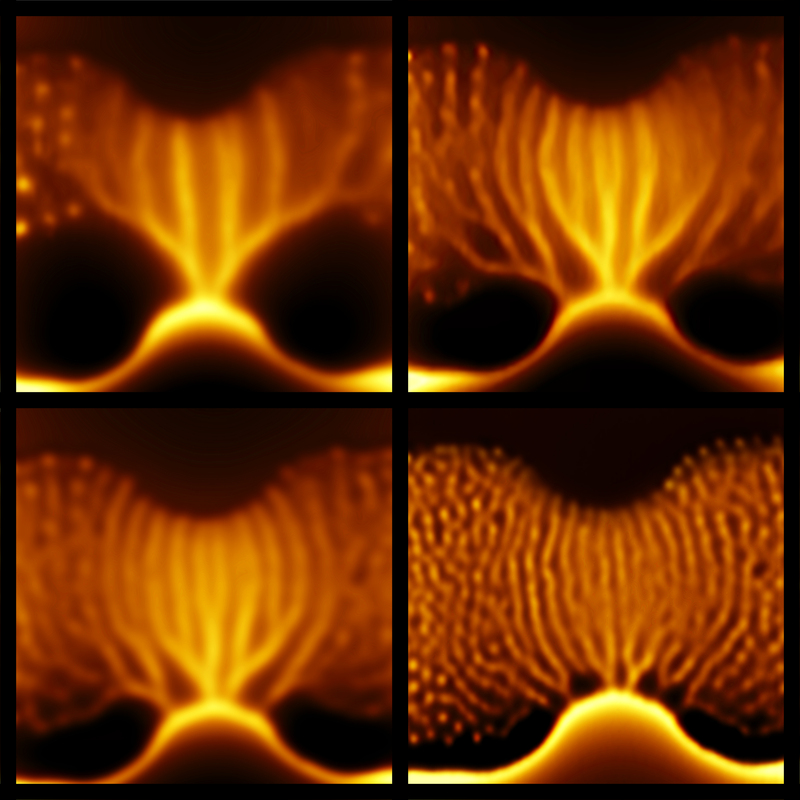 Now an international team of researchers, led by Prof. Eli Zeldov from the Weizmann Institute of Science and Dr. Yonathan Anahory, senior lecturer at the Hebrew University of Jerusalem’s Racah Institute of Physics, has shown for the first time how these vortices move in superconducting materials and how fast they may travel. They used a novel microscopy technique called scanning SQUID-on-tip, which allows magnetic imaging at unprecedented high resolution (about 50 nm) and magnetic sensitivity. The technique was developed over the last decade at the Weizmann Institute by a large team including Ph.D. student Lior Embon and Ella Lachman and is currently being implemented at the Hebrew University in Dr. Anahory’s lab as well. Using this microscope, they observed vortices flowing through a thin superconducting film at rates of tens of GHz, and traveling at velocities much faster than previously thought possible — up to about 72 000 km/hr (45 000 mph). This is not only much faster than the speed of sound, but also exceeds the pair-breaking speed limit of superconducting condensate — meaning that a vortex can travel 50 times faster than the speed limit of the supercurrent that drives it. This would be like driving an object to travel around the earth in just over 30 minutes. In photos and videos shown for the first time, the vortex trajectories appear as smeared lines crossing from one side of the film to another. This is similar to the blurring of images in photographs of fast-moving objects. They show a tree-like structure with a single stem that undergoes a series of bifurcations into branches. This channel flow is quite surprising since vortices normally repel each other and try to spread out as much as possible. Here vortices tend to follow each other, which generates the tree-like structure. A team of theoretical physicists from the USA and Belgium, led by Professors Alexander Gurevich and Milorad Milošević, partially explained this finding by the fact that when a vortex moves, the appearance of resistance locally heats the material, which makes it easier for following vortices to travel the same route. “The research shows that the SQUID-on-tip technique can address some outstanding problems of non-equilibrium superconductivity, ultrafast vortices and many other magnetic phenomena at the nanometer scale,” said Dr. Yonathan Anahory, senior lecturer at the Hebrew University’s Racah Institute of Physics. Furthermore, simulation results obtained by Ph.D. student Željko Jelić from Belgium suggest that by proper sample design and improved heat removal it should be possible to reach even higher velocities. In that regime, the calculated frequencies of penetration of vortices may be pushed to the much technologically desired THz frequency gap. The research uncovers the rich physics of ultrafast vortices in superconducting films, and offers a broad outlook for further experimental and theoretical investigations. In the future, this technology could allow researchers to test designs that aim to reduce vortex motion and improve the properties of superconductors. Researchers involved in this study are affiliated with Department of Condensed Matter Physics, Weizmann Institute of Science, Israel; Racah Institute of Physics, The Hebrew University of Jerusalem, Israel; Departement Fysica, Universiteit Antwerpen, Groenenborgerlaan, Antwerpen, Belgium: Département de Physique, Université de Liège, Belgium; Departments of Physics and Electrical Engineering, University of Colorado, USA; Verkin Institute for Low Temperature Physics & Engineering, Ukrainian Academy of Sciences, Ukraine; Department of Physics, Old Dominion University, Norfolk, USA. SUPPORT: The work was supported by the US-Israel Binational Science Foundation (BSF) grant No. 2014155 and the Israel Science Foundation grant No. 132/14. The research or individual researchers also benefited from support from the United States Department of Energy under Grant No. DE-SC0010081, Research Foundation-Flanders (FWO), “Mandat d’Impulsion Scientifique” MIS F.4527.13 of the F.R.S.-FNRS, and COST action MP-1201. CITATION: Imaging of super-fast dynamics and flow instabilities of superconducting vortices. L. Embon, Y. Anahory, Ž.L. Jelić, E.O. Lachman , Y. Myasoedov , M.E. Huber , G.P. Mikitik , A.V. Silhanek, M.V. Milošević , A. Gurevich , E. Zeldov. Nature Communications, July 20, 2017. doi: s41467-017-00089-3. Paper will appear online at http://www.nature.com/ncomms.